Is your work supposed to influence the happiness and quality of life outside the working hours? Can you imagine to be harassed by tremendous pain and bother in your daily working procedures? That is what the sonographers experience on daily basis. They experience extreme pain and we need to do something about that! Did you know that 76% experience shoulder pain, 65% experience neck pain, 20% experience hand and wrist pain? From the issues that we know of, we want to focus on how to help the sonographers to implement the solutions, so we can make their work procedures easier and by that they will achieve less pain when they are scanning the pregnant women. Therefore we saw a opportunity to make a equipment innovation, that will make their work easier. It is important to see how a new solution will be received by the users. A part of the case description focuses on the market potential for new equipment solutions. Denne video er et udkast til eventuelle ændringer i scanningsstuen. Ændringer består af et stativ og ændringer i opsætning af skærm og tastatur. Vi har lavet tilføjelser i forhold til at man kan stemmestyre transduceren og scanne personlige oplysninger på patienten, ved at inkorporere en scanner i apparatet. Denne idé kom vi frem til ud fra vores observationer, da vi var ude at se sonografen på arbejde. It was necessary to collect data in relation to the design process. The collected data was used to find the best design solution, which we then could work from. We visited the pregnancy-and ultrasound department at Aalborg University hospital. Here we met Gitte Størup who is a sonographer at the hospital. She introduced us to all of the working procedures and also all of the problems that they faced on daily basis. During the introduction, we observed which problems they faced during the scanning sessions. We also got the opportunity to video record the whole scanning process and by that collect data. We used Jon Kolko’s “insight combination” before we started the data collection. The model is used to find a solution to our problem. The model takes outset in an abductive process, where the process is to find the best design idea, from our empirical research and analysis. From “insight combination” we are able to find, not one final idea, but more, as they are based on the abductive process that is influenced by individual experiences. 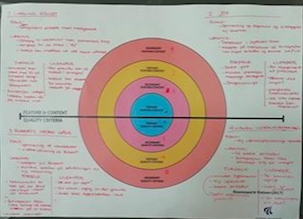 Based on “Insight combination” we started to map out what we already knew (What I know) about the issue. We mapped all of our knowledge into the model and then we were able to create an overview and a plan of what we wanted to focus on during our observation. The next step in Kolko’s model is the “What I saw” part. This part is the reason why we needed to see the issue in practice. At the hospital, we were introduced to the working procedures and the issues that occur when working with ultrasound scanning. We got the opportunity to watch the scanning of a pregnant lady, where we observed that the scanning-technique is not optimal. We also observed that their working posture is not appropriate in comparison to the execution of their work. After the data collection, we went to a company visit, where we met Lasse Thomsen who is a CEO at LT AUTOMATION, where we got the opportunity to see how his robot works in practice. We got introduced to a rehabilitation robot, which will be used as the base for the robot that they want to build for the ultrasound department. We got an insight on how to create a non-digitized concept solution, which led us to a solution that was not digital. We got the opportunity to try Robert out, and one of our group members got to feel how it worked, as she acted like a patient. We observed that Robert is a possible solution to the issues that the sonographers face on daily basis. 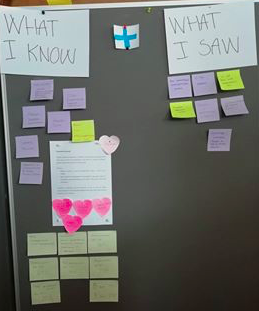 After the data collection, we were able to finish Kolko’s “Insight combination” where we mapped the insight (Mapping Insight), which made it possible for us to choose the most important issues in the ultrasound scanning field. After a lot of considerations and a lot of body storming, we created four concepts, which all consisted of a possible solution to the sonographers issue. To avoid creating something that has already been made, we investigated the potential competitors within the field. We ended up with concepts that were both simple and digital. The first concept is one of the more simple solutions. It is a stand that manages all of the wires so that the sonographer can get closer to the pregnant woman while scanning. 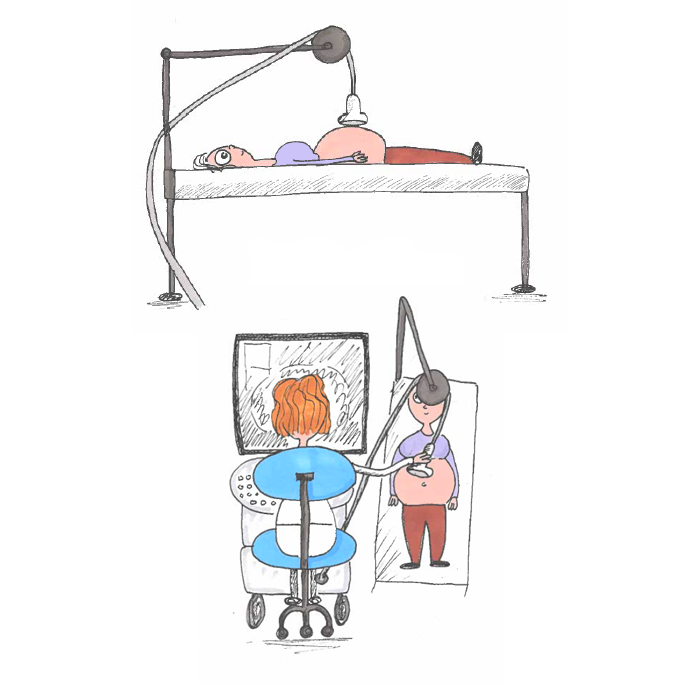 This solution also makes it easier for the sonographer to execute their work in a more optimal and ergonomic manner. This concept is based on the observation we made at the scanning session, where we noticed how badly arranged all the heavy wires were. The first concept is one of the more simple solutions. It is a stand that manages all of the wires so that sonographer can get closer to the pregnant one while scanning. This solution also makes it easier for the sonographer to execute their work in a more optimal and ergonomic manner. This concept is based on the observation we made at the scanning session, where we noticed how badly arranged all the heavy wires were. The second concept was also based on the optimization of the ergonomics as it is related to the transducer. The concept was inspired by a joystick, where we contemplate the placements of different buttons that need to be on the transducer. This will prevent unsuitable movements, and it will reduce the load. 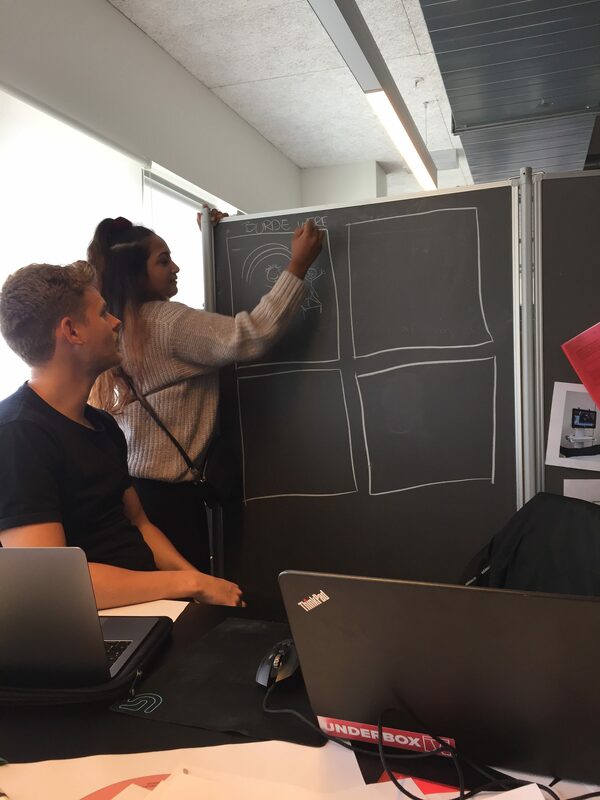 For more advanced concepts, we have created a more digitized concept, which originated from the already existing technology that Lasse Thomsen developed. 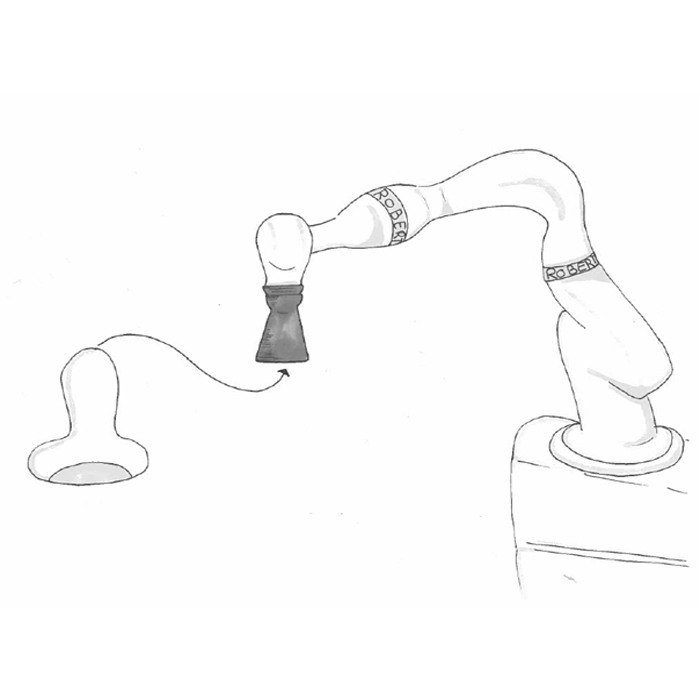 Our intention is to implement the transducer into Roberts’ arm, so the concept is some sort of an adapter. This will make the Sonographers work more manageable and also reduce the pain in their bodies. This solution is very digitized and is also a possible solution in the future. 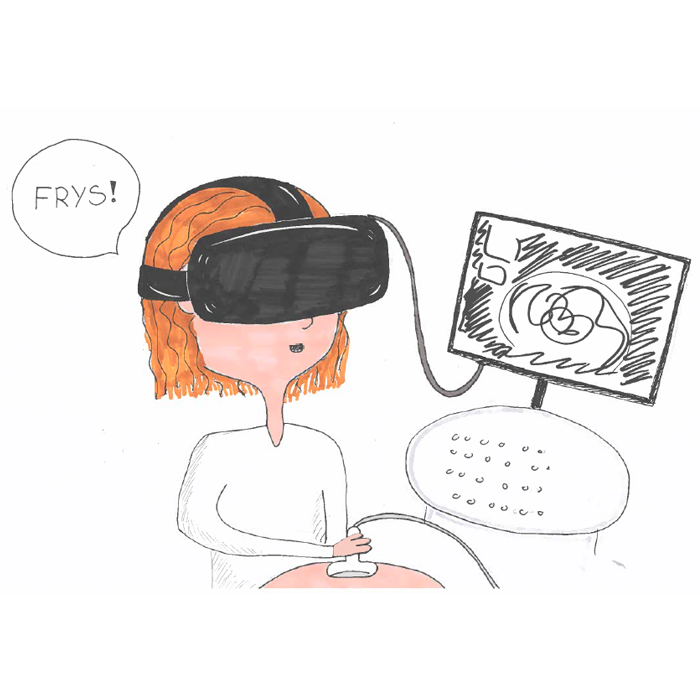 The general idea is that the ultrasound scanning will take place in Virtual Reality. The purpose of this idea is to have the ultrasound scannings picture right in front of the sonographers, so they can take more precise pictures of the embryo. To this idea we wanted to incorporate voice control, so the sonographer has the chance to “talk” to the scanning device in the sense that the sonographer can say “freeze” and then the device would print a picture of the embryo. For a more visual image of concepts, we decided to draw all of our concepts, so they would seem more real. One of our group members sketched out all of the concepts, so it was possible for us to mediate our thoughts to the case partners. Problemstilling: Vi har lavet en konceptskitse af de observationer vi har foretaget os på Aalborg universitetshospital, hvor vi er blevet bekendt med problematikkerne som ligger bag sonografens arbejdsmetoder. Videreudvikling af problemstillingen: Ud fra 1. Innovationsspor, som har et fokus på sonografens problemer, har vi lavet et alternativ som oplyser problemet ud fra en mere fængende tilgang, hvor løsningen på problemet er implementeret til sidst. Videreudvikling af koncept: Vi har lavet et koncept, som har til formål at mindske overbelastning i sonografens abejdsdag. Efter flere diskussioner med caseparterne, kom vi frem til de største udfordringer i arbejdet. Ud fra mødet kom vi frem til at slå to koncepter sammen og kreere en optimering af transduceren.